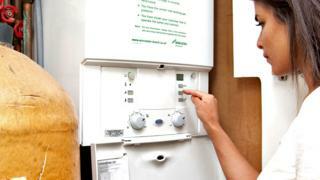 Gas heating for new houses will be banned by 2025, the Chancellor has said, although gas hobs will still be allowed. The homes will keep warm with devices such as heat exchangers – and with “world-leading” insulation standards. It’s part of a bid by Philip Hammond to address the concerns of children protesting about climate change. Green groups welcomed the measure but said the Chancellor had ducked major challenges on the climate. They wanted action to cut emissions from traffic, planes and existing draughty homes – which will form the vast majority of the housing stock for decades. Instead, Mr Hammond offered what they called an inadequate idea for tackling aviation emissions. He’s consulting on a plan to oblige all airlines to offer passengers the chance to offset their emissions by schemes such as tree planting. But these schemes are controversial and Greenpeace said it would be much better for the government to introduce a tax on frequent fliers. Mel Evans from Greenpeace said: “The Chancellor’s rhetoric may have been strong on the environment, but tackling the climate emergency demands much bigger thinking. “Issues like the shoddy state of our existing housing stock and rapid adoption of electric vehicles require serious money behind serious policies. The Chancellor won praise, though for appointing the Cambridge Economics Prof Partha Dasgupta to lead a global commission to estimate the global value of nature in economic terms. It’s hoped this body will influence governments’ view of nature in the way the Stern review of climate economics in 2006 influenced discussion on climate change globally. Reacting to measures outlined in today’s Spring Statement, Friends of the Earth’s Dave Timms said: “Instead of putting climate change at the heart of economic policy-making, the Chancellor is merely fiddling in the margins while the planet burns.